Hello, first thing I want to say is thank you to all who read my blog. I noticed when I logged in that I am nearly at 50,000 views. ( and over 5000 since I started the flags some months ago). Seems a lot so thank you. Second, I hope you like the stamps I am showing tonight. I found these while sorting more stock. I really like this issue. Pre 1997 and I am told that they are not valid for postage here in Hong Kong today. Shame, as I was planning on using them on the letters I send to people who buy from my Bidstart Store. I may just add one anyway. Nice addition a collection I would think. Nothing much happening at my end. Been a miserable day, weather that is. Another typical weather day for this time of year, a storm, so I made time to do some stamps. Very relaxing way to spend a few hours. And for anyone who sells stamps, I finished writing the September issue of the IPDA Newsletter. I will send a free copy if you send me your email address. Think about applying for membership. Certainly worth $20 a year to get some accreditation to help promote yourself and your credibility in the Philatelic community. I see so many sellers ( eBay notably) who honestly don't have a clue and are trying to sell material that just is, well, you know what I am thinking don't you. Check us out at http://www.ipdastamps.org/ and don't forget my Bidstart Store http://www.cddstamps.com/bidstart_store.htm No easier way to fill some gaps in your collection. 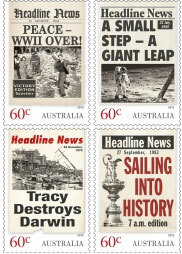 Great stamps quality at very competitive prices. Hope you like seeing the cover. 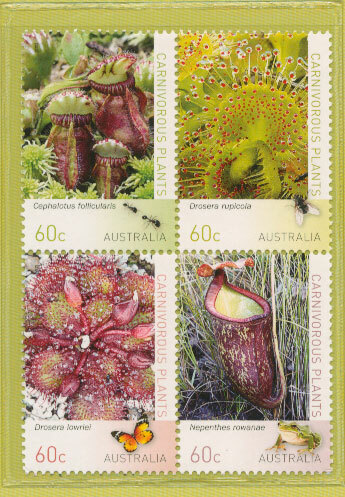 Hello, I am back in Sydney for the weekend and I found the Australia Post Stamp Bulletin in my mail box. We all, maybe, have a thematic interest. Mine is aviation as you know. One of my readers has chickens as his thematic interest. So for you, I show this new issue, to be released here in Australia on September 3rd. Apart from the three stamps there is also a miniature sheet to be issued and FDC etc Anyone wanting a set or more just let me know and I'll arrange a purchase if you are happy to cover purchase and mailing costs. Hello, Yes I am still alive and well and finally finding some time to write. I found the latest Royal Mail advertising material in my PO Box the other day and while they may be having problems with their staff satisfaction, impending privatisation and the ever increasing glut of new issues, they have produced what I think is a rather nice collectible issue with these cars. Of course, as you may know, it isn't just these 6 stamps. There is a Miniature Sheet with another 4 different designs and, of course, a presentation pack, which will also set you back a few quid.. So what was your favourite car. Hard choice? Well I just loved the MGB. Always wanted one but of course back then I was broke!! some 500,000 sold I read in the Royal Mail booklet and sadly production stopped in 1980. Yes over 30 years ago. Oh and since I have not told you about my Bidstart shop recently perhaps I should mention it. Fill that gap in your collection at very very very competitive prices. Just have a look at http://www.cddstamps.com/bidstart_store.htm actually stock numbers falling because of the good sales I am getting so will be adding more stock over the coming weeks I hope. Don't miss out!!! Especially if you are after recent GB as I have some quite nice 2012 / 2013 stamps recently listed. Hello, sorry, been offline as no internet as moved house. But finally got myself connected thanks to Virgin Mobile. No way could I rely on Telstra. What a bunch of incompetents. Am think of cancelling my Telstra booking which is now delayed to next week, when of course I will be in Hong Kong. How else to tell them they are just so useless. But do they care. No!!!! Hello, Hope you like these. Rather interesting topic I think. Carnivorous plants, found in Australia. Issued by Australia Post as you can see. The black marks on top two stamps are insects, not dirt marks. Not even listed yet on the Australia Post website, well as I write. You see them here first :-) Would write more if I could see more but am moving house tomorrow and Wednesday and have already packed my desk light and magnifying glass so cannot read the small print on the reverse of the presentation pack. Old age eh!!!! Hello from Sydney this time. Arrived here this morning after a grueling 9 hour flight. Not normal I must admit. Virgin Atlantic were fine, seat was comfortable, meal was very nice, movie was entertaining and cabin crew were wonderful. So what could possibly be wrong. Well along with all the other passengers in the premiun economy cabin, I didn't sleep because a husband and wife had two very young children who cried and screamed all night. Yes all 9 hours from the time we departed Hong Kong to the time we landed in Sydney. I am serious. This was the worst flight in 40 years of flying. Children from hell on a plane. I hope it never happens to you. The poor cabin crew could do nothing. The parents didn't even try and had absolutely no consideration for the other passengers. They seemed to have the attitude that this is what their kids did so tough to all of you. No one spoke up and no one complained, except me of course LOL. I am not a shy person when it comes to my sleep being interrupted or the people around me not showing common good manners and respect. But the couple seemed to think it was ok. Is this the new style of parenting I wonder. I traveled the world with my children when they were very young, and I mean from 6 months to 6 years, and we never had this sort of behaviour from them.. They knew good manners even then. But it seems some of today parents have a different view, well these parents did. Oh well, I am sure they have their problems and given their attitude with their awful children they will get worse. Serves them bloody well right. Now to stamps. and, hahahahahahahaha they are funny if you think of what I just wrote. Those kids should have been in a barrel in the cargo hold if you ask me LOL. 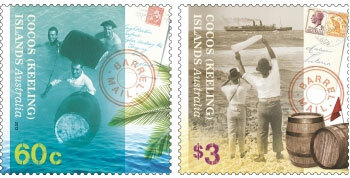 From the Australia Post web site ... " From around 1909 mail and other essential items were delivered to the Cocos (Keeling) Islands within barrels lowered or dropped from passing P&O and Orient Line ships. The approaching liner would notify the cable station on Direction Island and staff members would collect the barrel from their jukongs. At the same time, outgoing mail was sealed in a tin can and attached to a line trailing from the ship making the drop. 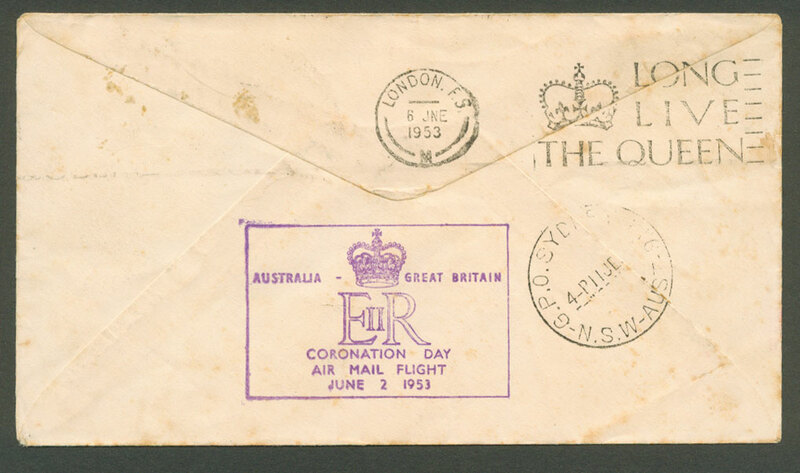 Some mail dispatched to and from the islands in this way carried a range of postal markings and cachets such as "Tin Can Mail" or "Orion Barrel" (in reference to the RMS Orion). 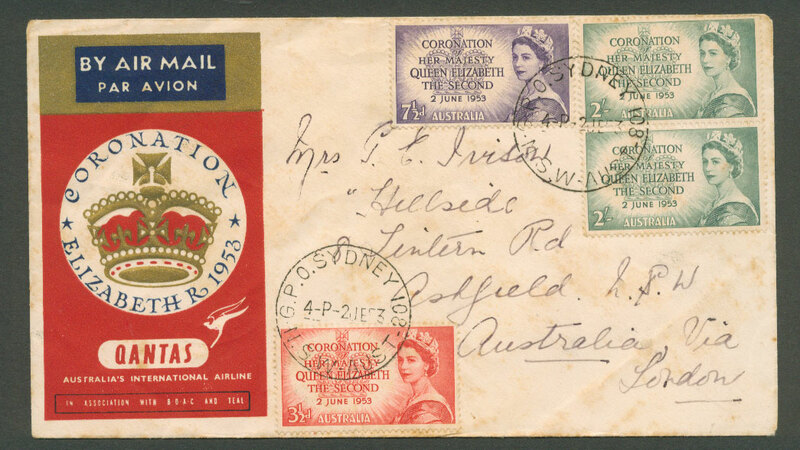 A regular air service, first introduced in 1952, put an end to barrel and tin can mail in 1954. Enjoy your stamps and if you are flying with children please think of the people around you. Good manners, respect for your fellow passengers and decorum are just so important and can make everyone's life that much more enjoyable. Hello, been a busy past week and while I wanted to write I never made the time. Hope you like the stamps, best I can find for these two gentlemen. The reason I am showing these is because, as you may know, the date the other day was sort of significant if you like numbers. It was 5 8 13. Which you may also know is a Fibonacci sequence. That is, that the first two numbers in the Fibonacci sequence are 0 and 1, and each subsequent number is the sum of the previous two. In fact one can do a bit better because by taking the time in account it was 0 1 1 2 3 5 8 13. Anyway, for a little prize. No idea what yet, but you know my prizes are stamps and always a nice addition to your collection, just send me an email to cddstamps@gmail.com with an answer to this question there may be more than one answer but I know of one specifically. What is the link between Euler and Cauchy. Both renowned mathematicians is not the right answer by the way. There is a link believe me. Enjoy your stamps and the interest they can bring (well lets exclude most of the modern rubbish which even though commemorating something or other are pretty boring by comparison to these two lovely stamps. Just my view. 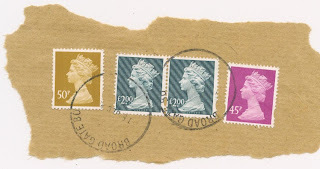 Hi, over the years I have been writing I have shown a variety of stamps and expressed my views on the aesthetic quality, if that is a correct interpretation, of the stamps produced in current and past recent years. 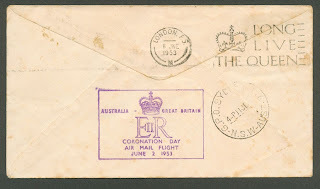 These above prove once more to me that the postal authorities, in this case Australia, are just producing stamps in the hope - and it seems reality - that people will part with their money. For what? A new issue with no relevance other than to part the collector from their money. It saddens me to be honest. There will soon be hundreds of thousands of these in albums (maybe) gathering dust so to speak. 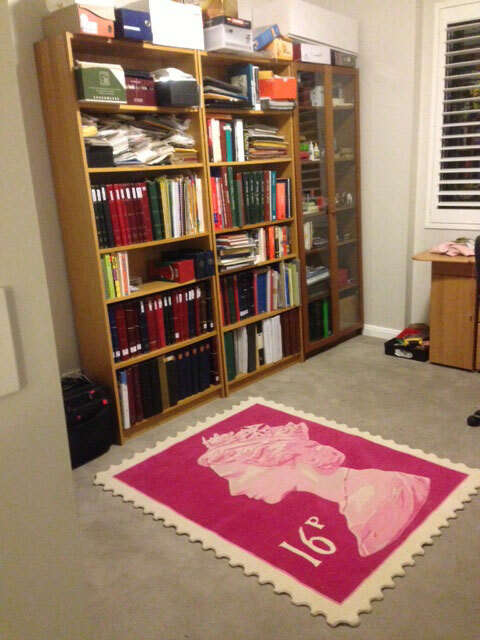 You can buy - and I have from auctions and friends - many years of Australia mint unused from the 1970s onwards and at prices way below face value. A friend recently asked me for my opinion of his "collection". Boxes of unopened Australia Post mailings of new issues. 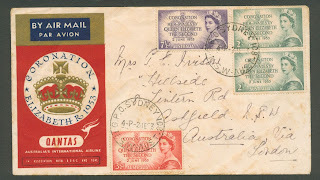 Years and years of mint in the envelopes Australia Post had mailed to him. Mostly worth less than face and certainly not salable at a profit. I advised him to use as postage. He won't have to buy stamps for many years to come. Probably in his lifetime. The same goes for GB. I cannot sell Mint GB below face value. Used is different, as there is so little new issues "used" on real mailing these days. Look at eBay and see what prices "used" command. And that is if you can get fine used, as the postal authorities seem determined to damage stamps at any opportunity they get with their heavy frankings or pen cancellations. I am rambling on one of my pet topics I guess. But surely we need to get across this message to the Postal Authorities, or is it impossible to get people, collectors, to realise they are simply wasting their money buying these all to frequent new issues? Your views?????? For the record I used to collect new issues. I stopped about 10 years ago as it was just getting silly, and it has got worse. Never a month goes by without, for example, Australia Post or Royal Mail, finding an excuse for yet another new issue. Hello, tonight, Machins. Now I know many think these are boring but how one thinks that is beyond me. :-) So much to study and understand. So many varieties, so many colours even. I am moving house as many of my readers will know and while clearing out I found these. 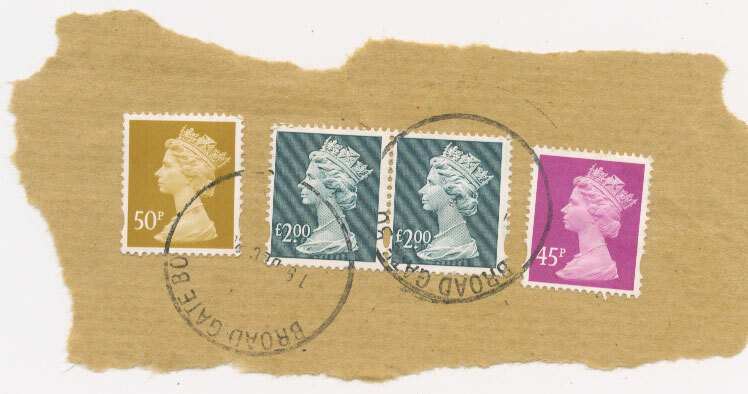 How lovely; even the franking has not ruined the stamps. From a very quick look I think the £2 copies are SG Y1801, cat used £2.25. the 45p is Y1721 cat at £1.50 and the 50p is is Y1725. Nice catalogue value. I will list them in my Bidstart store http://www.bidstart.com/stores/michaelatcddstamps one day I suspect. Time is not on my side at the moment I have to admit. Hello. I am back in Sydney for the weekend. Came in overnight on Qantas. An A380. lovely aircraft, no matter how many times I fly on one I always enjoy the flight, When I am awake that is!!! Qantas seat pitch in Premium Economy was just like the "old days" business class. Their food was pretty good as well. Great flight really. Now if only they could get cabin crew who were interested in you, the passenger, that would make it for them. Simply put I can say that throughout the flight when I did see the cabin crew, which was not that often, they made no eye contact with passengers. When you fly Cathay, Singapore, Malaysia for example, the cabin crew look at passengers to serve them. Qantas cabin crew look away and I think they pray they can get through the cabin, on the infrequent times they feel forced to walk though, in the hope a passenger does not ask for something. In Summary: Qantas: aircraft, excellent; food, very good; cabin crew, there because they had to be. More when I get some time.